Holy ghosts and goblins!! October is going to be a SPOOKTAKULAR month filled with ghoultastic giveaways, zombilicious author interviews, creeptacular book reviews, and so much more!! 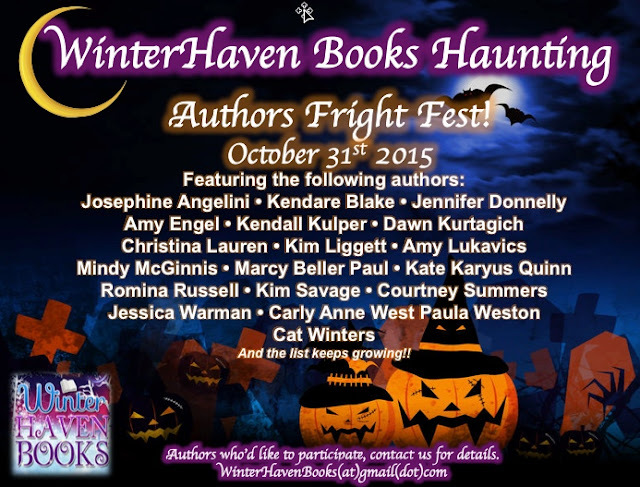 So get ready to stop by WinterHaven Books throughout the month of October to DRINK, READ AND BE SCARY!! Authors, it's not to late to join!! For more details contacts us at winterhavenbooks(at)gmail(dot)com to see how you could be part of this monster mash! And now for the exciting stuff! To kick off our WinterHaven Books Haunting month, we're featuring the following giveaway. Be sure to fill out the rafflecopter and share with us what creepalicious book you plan to read this month!! This giveaway is open internationally to wherever The Book Depository delivers to. Good luck! I plan on reading the last book in th Enemy series by Charlie Higson. These zombie books scare the crap out of me. I want to read a book by Mindy McGinnis or Cat Winters! I've read two already; Jackaby and Miss Peregrine's Home for Peculiar Children. Hopefully, I can do the sequels before the month is over. I just finished, and truly enjoyed, Blood and Salt. I also just finished The Cemetery Boys, which was just okay. I am having a really hard time finding a good, truly scary YA horror. IF you have any recommendations, THAT is what I plan to read. Thanks for this awesome giveaway! Try Monsterland by Michael Phillip Cash, $.99 for kindle and Lockdown (Escape From Furnace #1) by Alexander Gordon Smith, $2.99 for kindle. I was going to pick up Miss Peregrine's Home For Peculiar Children soon. Thank you for this opportunity to win a great giveaway!!! I too just grabbed Miss Peregrine's Home For Peculiar Children at the thrift store. I also just started Monsterland by Michael Phillip Cash. It is creepy paranormal. Two days ago I finished a zombie romance series by Ember Shane call The Doyle Hawthorne Series (3 books). It was a great read, and I think the first book is free on amazon. Then I have a Joe Hill book that I am terrified to read because I have been that it is a VERY scary book. For a bed time story with my kids I just finished Monstrovia by Marl Haskell. I loved it. One of the best middle grade novels I read this year. I plan on reading Library of Souls!